Milestone birthdays are occasions for celebration and reflection. We’re looking back on 150 years of museum making. What choices did our predecessors make? What did they decide to collect? What did they overlook? Birthdays are also a time to plan next steps. As we look ahead to our 200th birthday, we are aware that our efforts today will be scrutinized in the future, just as we are now contemplating the work of our past museum makers. We need your help. What matters most to you about Nova Scotia in 2018? What are you talking about at the coffee shop, on social media, and at the dinner table? 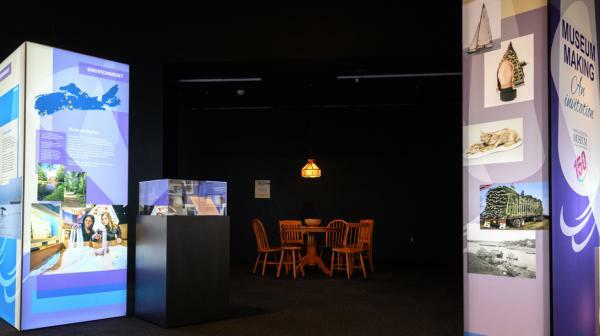 There is a Mi’kmaq word, Piluamkek (pronounced bee-lou-aam-keg), which means “a changing place.” As you tour this exhibit, you’ll see plenty of evidence of the profound changes happening in Nova Scotia and the world in 2018. What stories should we collect about this changing place for future generations? The Museum Collection is our primary resource for telling stories about Nova Scotia’s natural and cultural history. We acquire specimens and artifacts in a variety of ways – field work, gifts, transfers, bequest, and purchases. The Museum however can’t accept everything we are offered. We have criteria that our curators use to review potential acquisitions – Is it significant to Nova Scotia? Is it in good condition? Can we properly care for it? Once an item becomes part of our collection it might be put into an exhibit, but more often, it will be preserved in storage where it can be studied. Now that you have an idea of how we “make” our collection, we have a favour to ask. To mark our birthday, we’d like your help in choosing about a dozen items from 2018 to add to our collection. This exhibit may provide a little inspiration. Please share your ideas with us on the tag board activity in the exhibit or on our webpage. Museums should get people talking and learning about different perspectives of our diverse heritage. Gone are the days when museum visitors were expected to stare passively at exhibits while maintaining a respectful silence. Talking with each other is one of the most enjoyable and powerful ways to experience a museum. To make this exhibit, we asked a diverse team of researchers from our Museum sites across the province to explore what matters most to Nova Scotians in 2018. This resulted in the eight themes - each presented here on a four-sided pillar that includes an introduction, two “spotlights,” and a link to the Museum’s work. Our thoughts on these subjects are not meant to be exhaustive, nor are they neutral. Visitors and future museum makers will no doubt point to our biases and prejudices – that’s how museums evolve. We hope that the exhibit will spark some lively conversations.